My last post took a look at the value of unique data visualizations. Here is a different example from John Ehlers' site, integrating cycle and trend perspectives across multiple time frames. 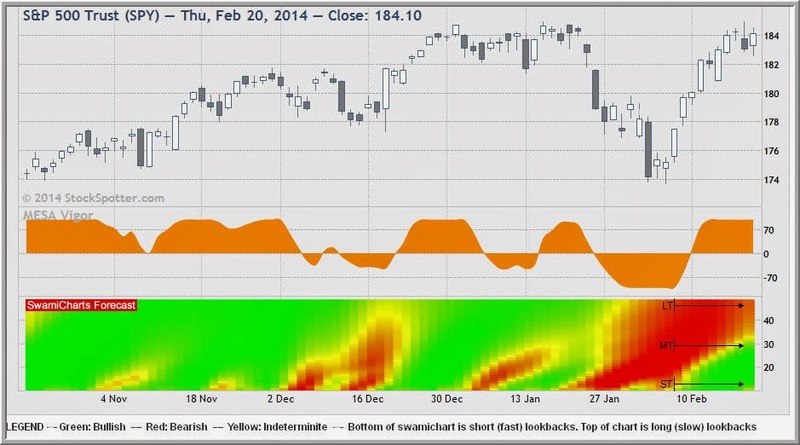 The middle (orange) display captures dynamic cycles; the bottom is a forecast heat map organized from the longer time frame (top of display) to the shorter one (bottom). So you can see SPY is in bullish mode over the shorter time frame and is starting to turn more neutral from bearish in the longer period. It takes a while to get a feel for new displays, but the effort is worth it.